A huge board of Xtratherm. 10cm deep, 81cm wide and 169cm long. I was thinking of making two different Arcworlde boards for Troubles in the North. I also toyed with the idea of a cross roads map. In the end I settled on making the battery at Brecourt Manor. The only problem was modularity and mobility. the board as is is huge and unweildy (hence the chipped/torn edges). I wanted to make it as two boards with interchangeable positions - I love the assault on the guns, but not enough for it to be all I play! Taking the line diagram above, along with the satelite image from google, I started to use GIMP to work out a board. GIMP allows images in cm measurements so things can be scaled appropriately. Although the guns line up with the hedge row quite well, the fields to the left of the image dont...GIMP to the rescue! This plan, to scale with my board, has the hedges moved and re positioned to match the google earth view. This fits nicely with a two part board where the left hand board can be moved and rotated to match any of the other edges! Unfortunately there is a minor hitch...at this scale 6 inches and the 25mm bases don't quite work...and to run an 80cm x 80cm board I need to lose 10cm from one end! 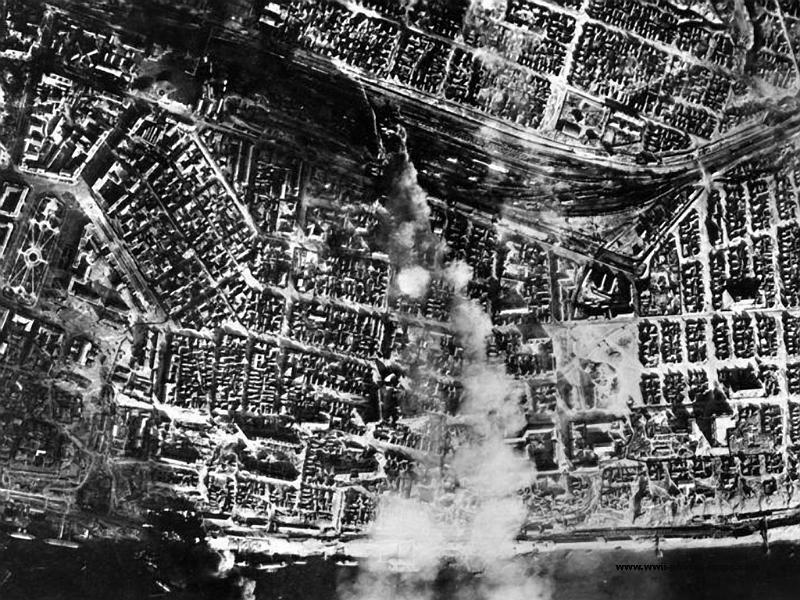 For some time, Brother Handro and I have wanted to build a Stalingrad board....but Stalingrad has buildings, and roads, and rubble, and trains....and is generally...difficult. Here are a selection of my key thoughts and my first steps with this process! First off is the iconic fountain. This iconic fountain from Stalingrad has been nicely replicated in 28mm by Puppets war, and can be found here. I already have this, and so of course will be using it for this project. I helpfully heard of some cheap plastic, battery powered train sets for sale in a local bargain store and went out to buy two of these sets. They are pretty basic but have some details. 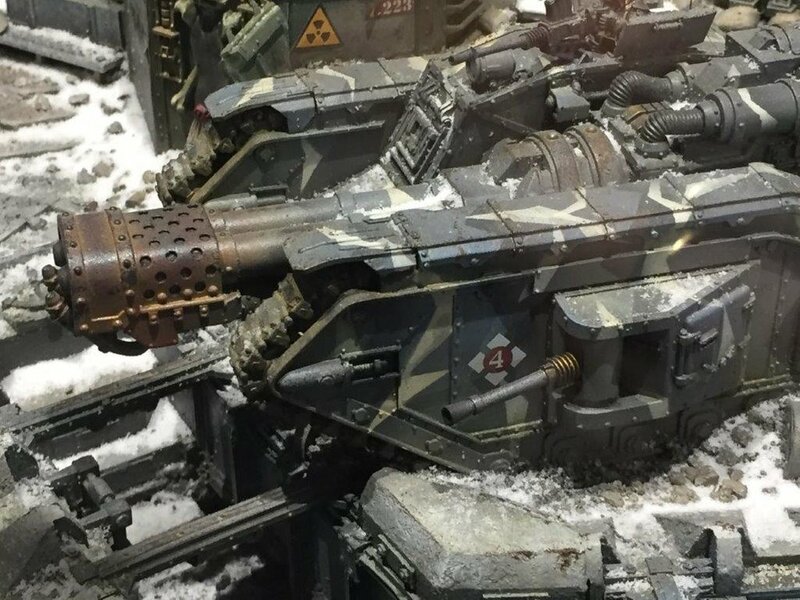 I think with some damage, some heavy weathering and a nice big star on the front they will do nicely! Finally I need an idea for the layout. 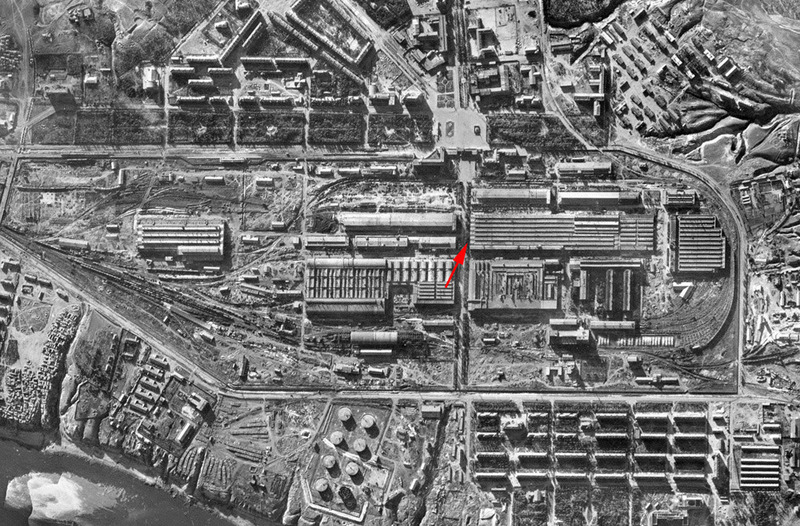 For this I will be looking through top down images of Stalingrad to find some ideas and inspiration. Im hoping to make a 4x4 or 4x6 board for this project, modularity might be sacrificed for the greater good, but 4 2'x2' boards could work too! Watch this space! 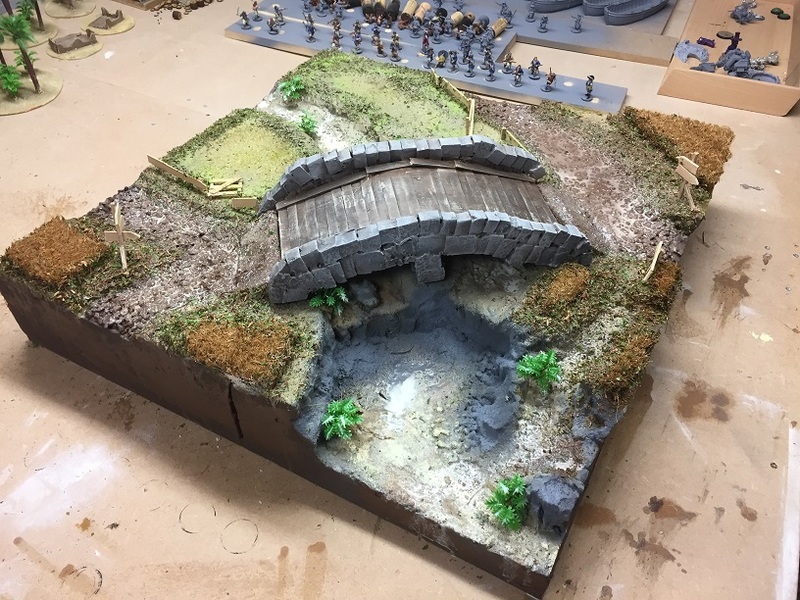 Tagged: bolt action, terrain, Idea! 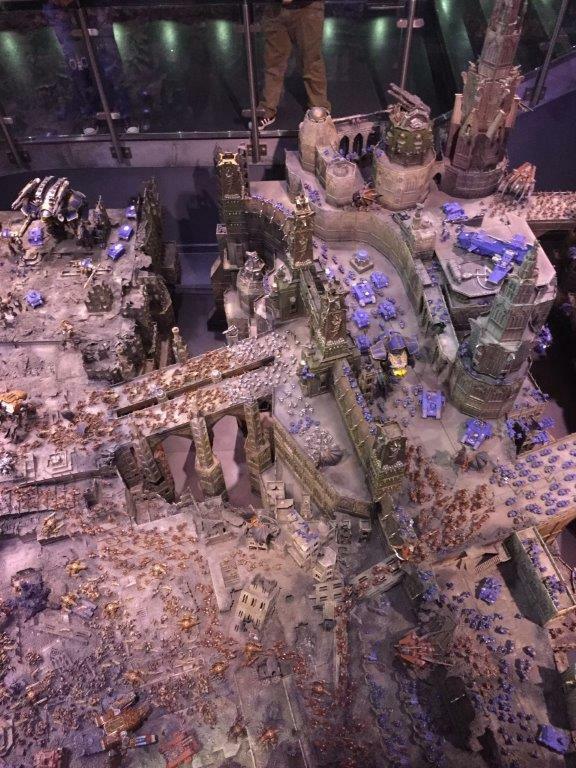 Warhammer World Museum - Terrain ideas! 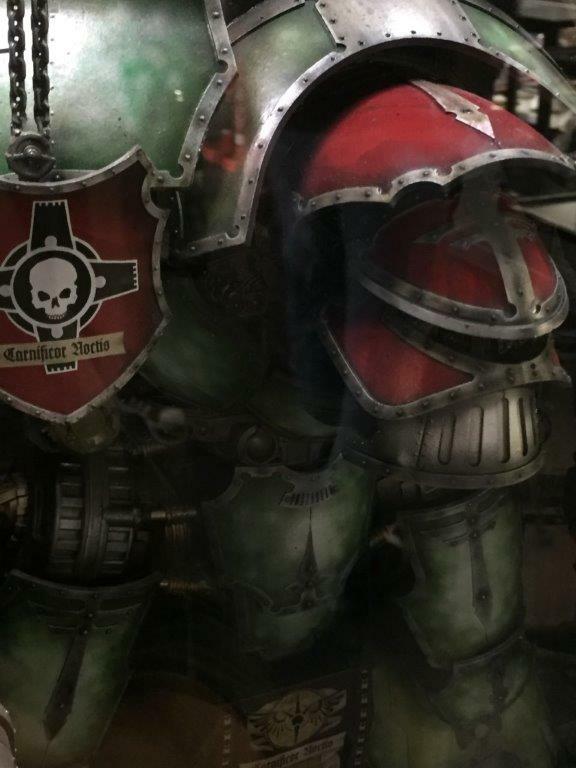 Warhammer world is all about toys. Whether it be looking at, or buying, or craving....it is about our little toy soldiers. 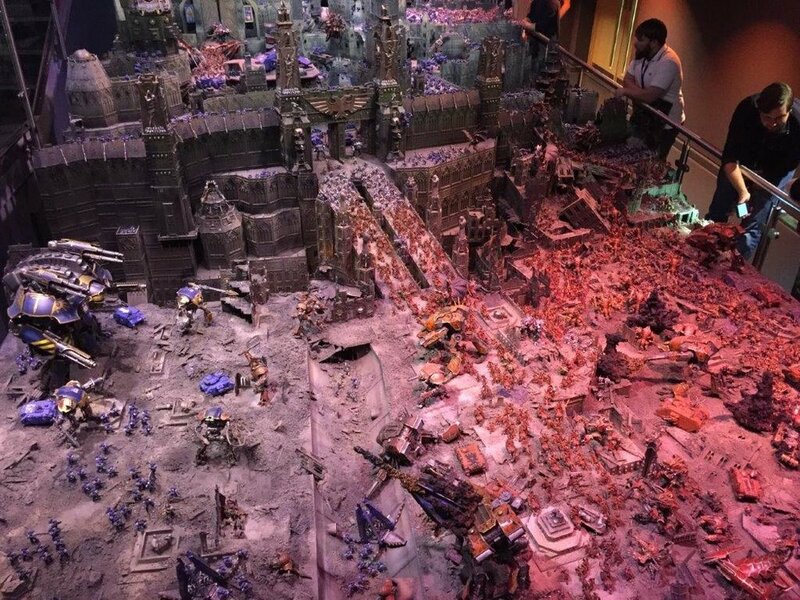 There is even a museum/exhibition about our toy soldiers...and in that museum there is terrain. C) Things I want to replicate! This board is in the lobby by the entrance. 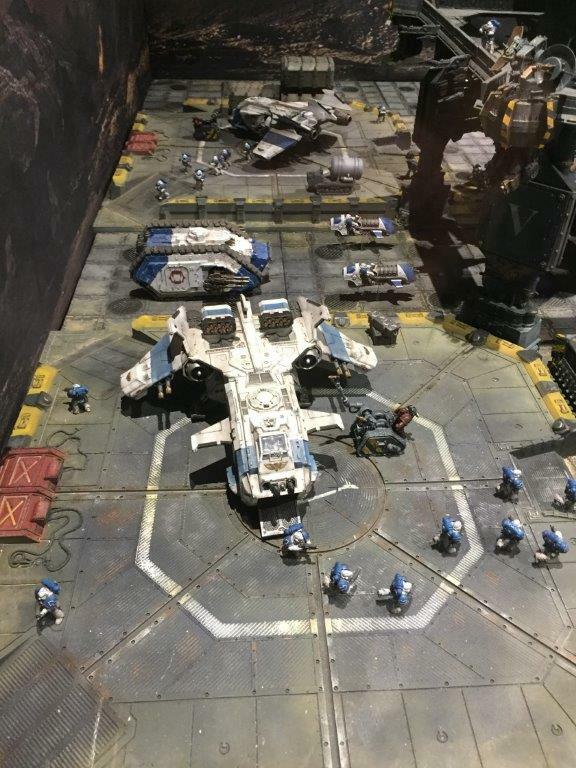 A reasonably sized set-up, it is clearly made to show off the new Dark Imperium set, with multiples of this started box on display across the edge of a refinery. The pox walkers all have orange jump suits, and the muted flesh tones work really well. The gravel is excellent - In my view mostly due to the range of sizes of talus involved. Showing off the new not-dwarf line we have mountain tops covered in clouds - not real use fo my needs but very good none-the-less. Always wondered about an aeronautica imperialis or similar game with a cloud base, and long wire stands for the planes. A layer of garden planter foam 3" thick with and inch of cotton on top. Could work well! Der H: "If only we played blood bowl"
Brother Handro: "Nooooo, stop it! stop it!" The prospero board has had a lot of attention in the last few events - rightly so! It is a lovely set up, good scale (not too big to miss details) and with some great damage effects on the plinths/columns. Very tempted to replicate it! The star port board is amazing, partly due to the amount of hardware on the board, and partly because of the attention to detail. ZM tiles and some of the realm of battle tiles come together beautifully - I only wish my eventual Grandian starport will be half a good! Dark angels battling nurgle....yes please! 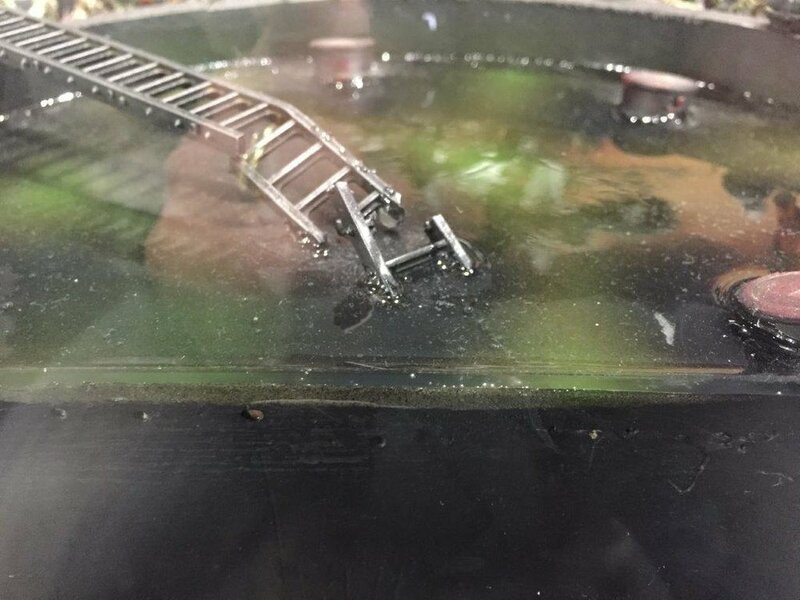 Great board with liquid effects, gravel and shipping grates. Good missile effects too! Snow, trenches and Krieg! what isn't to like. The snow is interesting and i cant quite work out what it is. White sand? Bicarb? who knows! But it is beautiful! One of the other games I play (Handro: "Bit free and easy with the word play today aren't we?") is ArcWorlde by Warploque Miniatures. Alex Huntley is the guy who runs the show, and they've now had three successful kickstarters (ArcWorlde - The Fantasy Skirmish Game, ArcWorlde - Battle for Troll Bridge, and ArcWorlde - Troubles in the North). The game has a small but very keen fan base, and the latest kickstarter was HUGE. I came late to the ArcWorlde party and missed the first KS. Since then I've backed the Battle for Troll bridge set and more recently the Trouble in the North set. The Board started out with a VERY thick piece of foam - I wanted there to be a waterfall (still currently without water....), a bridge, roads and some fields. Blue foam is great, but without a hot wire cutter it is a pain to sculpt. Here you can see, not only the carved out board and the bridge itself, but also the desperate state in which I so often find my bunker! The game it self comes with a paper 'bridge' with the dimensions recommended for certain scenarios - Those measurements were used to make a card base, and build up with crude blocks to form a fantasy bridge. 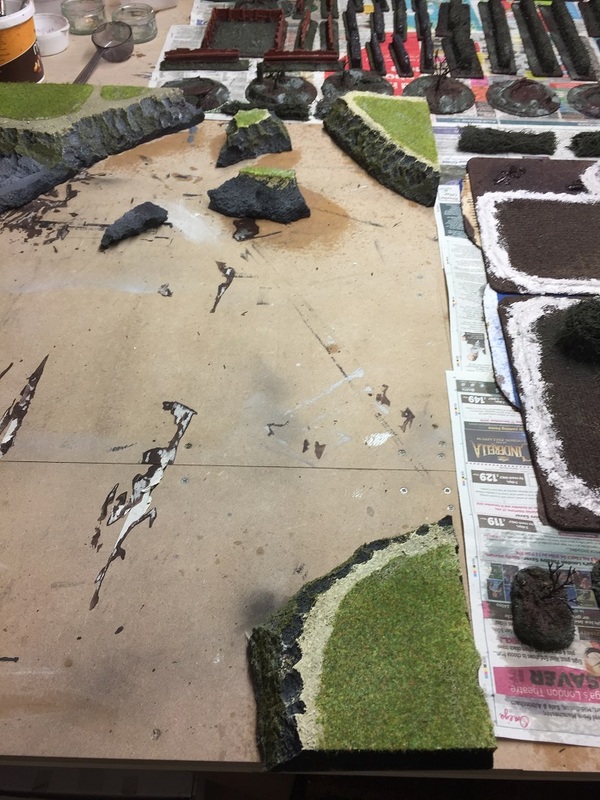 Brown paint, flocking and some stones gave the terrain more detail, and (after several missing steps) we have the near finished board below! The fields are the good old fashioned coir doormats - made 'famous' in my trench board. The bridge was sanded, painted grey and drybruhsed for a basic but effective finish. The plastic plants have since been toned down and the fences further stained. The river bed was given an additional layer of sand also. It is nearly done I think! Just need to do some water effects and a final layer of sealant in the form of PVA glue. 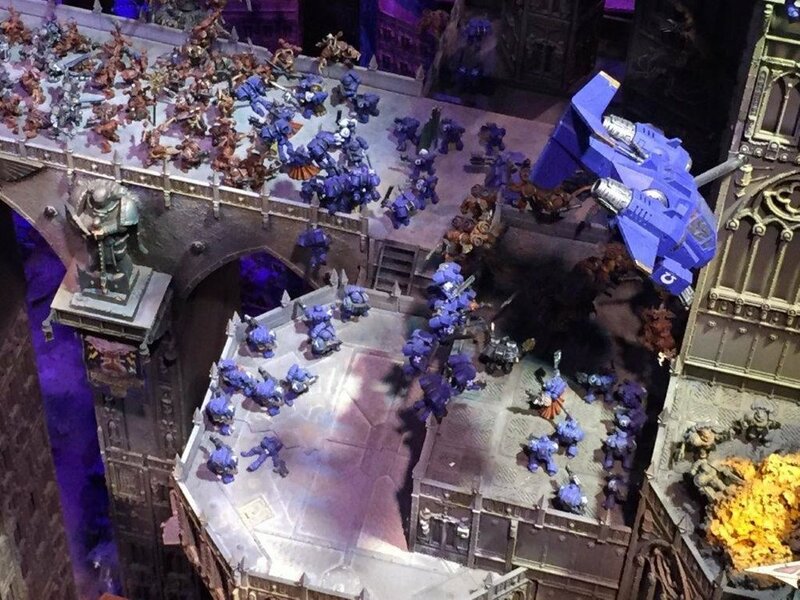 This weekend was certainly a terrain-heavy weekend! These hills have been drybrushed and static grass-ed. I used a mixture of light and mid tones with mid tone 2mm and light tone 4mm static grass. 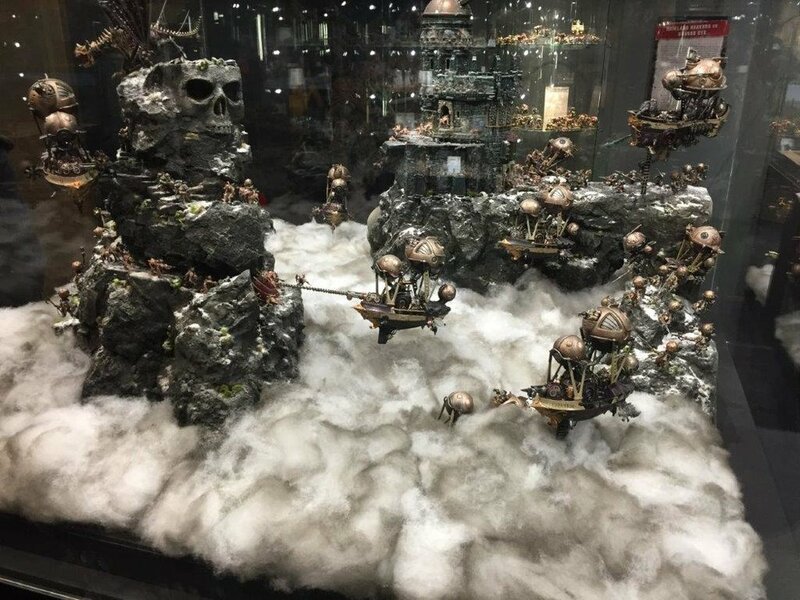 They've also had a dusting of dark tone flock to fill gaps and I think it gives it a nice balance between light/Pirate themed sunny terrain and being "too light". Had a go today at making a flexible gaming mat from canvas and silicone....needs work but it is progress! The silicone has shrunk a little but the table is slightly bigger than 4x6 so hopefully I can cut it down to a nice 4x6 mat. White paint and have done with it! White paint/filler and have it thicker over certain areas? Someone on Facebook recommended Aleene's 4oz Speciality Glue - True Snow...Has anyone any experience with this product? I also got some trees onto their bases. I have 18 of these in total - made from Gutter guard (a tutorial might be something I do later....) They fix into their polystyrene bases pretty easily. I'm hoping that this board can be finished with mat, scatter terrain and all the snow flock by the end of this next week. However I have some long days and some night shifts coming up, not to mention the Forge World Open Day 2017! What are your thoughts guys? Grandia Viridis is an agri world, and most of our games are played across fields and farm machinery, but I wanted to make some game boards to represent the more 'dug in' areas of the campaign - region spanning dug in fronts where the imperial militia/Grandia defence forces could wage longer wars of attrition, cities defended by trench works, the usual. The boards are all 2"x2" and each have a road on one edge. This can be a central highway, smaller access roads and can be arranged in a variety of ways quite easily. It's all mounted on regular (and cheap!) polystyrene, with trenches cut into the board. 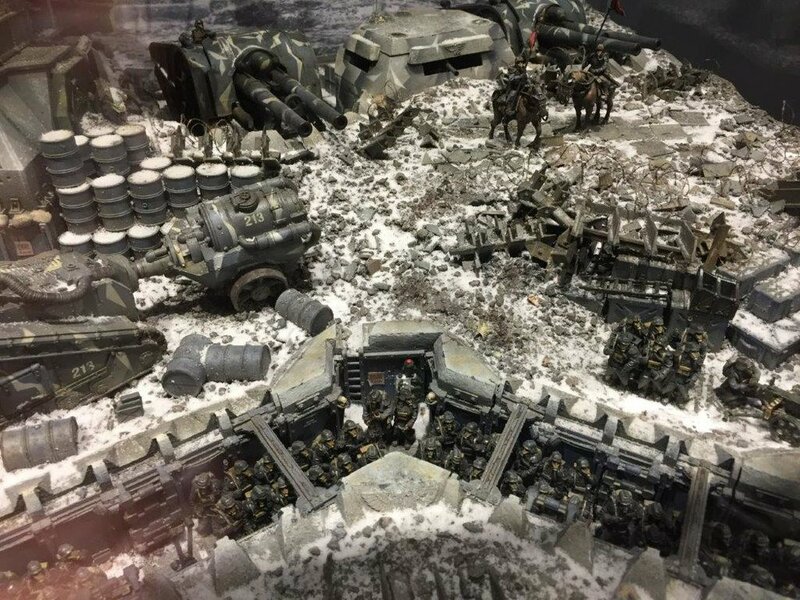 The trenches are deep, marines heads stand proud but most guard/human scale models are well hidden so trench steps will be a feature in due course. Metal trench walls, sandbags and mud is the main theme and, if I say so myself, it works quite well!! The fields are made from a large coir doormat, but here in lies the problem - there are some big areas of mud in between full fields but no debris/detritus! My dilemma is this...should I shred some coir mat/natural fibre plant liner and make crushed broken crops in all of the flat muddy areas? It would let me put in tracks of vehicles to show that it was all fields and not just bizarre planting methods. It would allow me to bury some plastic humans/drums/barrels/czech hedgehogs and wire as casualties/detritus of war. How are you finding the blog? Thought of the day: " How can a man understand and appreciate the time of peace when he has never been in the trenches of life." Huzzah! We have an ocean! I was going to use the canvas/silicone trick to make a flexible mat, but the paint adhered so well to this other sheet I had, well, I just left it! It has a heavy brush of lighter blue and then white to make it stand out. I might leave the tan coloured edges....looks more like a map!